I know there are a lot of chocoholics out there that will be able to relate to this lifetime tale of woe. I admit it, I’m a chocoholic. Every Christmas, my entire family gets a huge Toblerone bar from Santa in their stocking. This is amazing because, coincidentally, Toblerone is my favorite chocolate bar. What are the odds? As we were talking about potential ideas for this blog my husband pointed out how many “chocolate stories” there were that I could use. I asked him to give me an example and he pointed out that he has never, ever, even once gotten to eat his Toblerone bar. “Why?” I asked. “Because every year you devour your own Toblerone bar while I’m making the kids their breakfast on Christmas morning and before I can even begin to think of eating mine, you’ve already eaten it.” “Is that a problem?” I asked. “I didn’t even know you liked the damn thing”. He replied that since he’s never gotten a chance to taste it, how the hell would he know if he liked it or not? At this point, Andie chimed in “Yeah Mom, remember that time that you ate my entire Christmas chocolate stash when I was sick?” I pointed out that there were extenuating circumstances. Andie was in 10th grade and was very, very sick so she had to stay home from school. She was miserable, and in a rare act of compassionate mothering, I decided I would hang out with her on the couch in the family room. She, of course, having about a 104 degree fever, fell asleep immediately and I was left with nothing to do but channel surf. All that was on was a “Real Housewives of Orange County” marathon so, me being an amazing mom and all, decided to stay put and start watching said show. You could hardly expect me to watch this type of high class entertainment without a snack, so I looked through all the Christmas stocking stuff and lo and behold, I located a completely unopened giant Toblerone bar. This was a MARATHON so of course I finished the entire bar. When Andie woke up she saw the wrapper and asked for a piece of chocolate. I replied that somehow, the entire bar had disappeared. She couldn’t believe I didn’t save her a piece as it turns out that indeed it was her bar. I informed her that she was sick and eating a giant Toblerone bar would have been really bad for her so as a favor to her, I ate the whole damn thing and by the way, I was feeling a bit ill and could she be a little bit nicer to me. To this day, she tries to make me feel bad when all I was doing was taking one for the team. Halloween is another holiday that can be a bit difficult for me. Back in the day when my kids were young (and cute … and silent), they would come home with these gigantic plastic pumpkins filled with candy. Of course, what kind of mother would I be if I let them eat all that crap? It’s bad for their health, not to mention their cute little kid teeth. So, in yet another altruistic move, I would cull their pumpkins of Reese’s Cups, Milky Ways, Snickers, and a few other bars. Did they thank me? NO, of course not. Instead, they would rat me out to their father who would come in a give me a stern lecture (or at least try, I have a complete anti-lecture policy in place) on eating my children’s candy. Can you believe that? It’s not like I had my own pumpkin filled with chocolate! Where was I supposed to get some if I couldn’t eat theirs? Sharing is an important lesson and as a superior mother, I was imparting some basic knowledge that would be useful for the rest of their lives. Unfortunately noone but me ever looks at these situations like this. Well, you get the general idea about my chocolate issues. I have many, many more chocolate tales to tell and I will … soon. sadly I am thinking, do you think this is an original state of affairs. I think all mom's steal the chocolate and all the other best snacks given the opportunity. Although, I am looking forward to the other chocolate stories…..
if you can't guess who this is, then you are a fail. after that first sentence you should probs already know, and know once again after having used the abbrev "probs"
anyways… i can't believe you told that story about andie being sick and you eating her chocolate and neglected to mention that when i was sent a freaking awesome box of sweet london chocolates, you devoured the whole thing while i was high on narcotics and poor little me didn't get a single piece – that's a tragedy if i have ever heard of it. Ever since menopause, I lost all interest in chocolate…well, most of it. This year I've been dreaming about Christmas chocolates. I mean I have dreams where all that are left in the box are my least favorites. I had to eat them. I mean, there are people in China who have never even heard of maple nut creams. I can't very well let them go to waste. HA HA!! It is nice to know that I am not alone in this. Every year for all special occasions I buy the kids (and hubs) the candy I like! HA HA!! Then I eat it. If it's left alone unattended then it is fair game!!!! Halloween, I thought was meant for parents anyway! I love how you "thought" of your kids well being and saved them from cavities!! You're such an awesome mommy!!!!! Now, to buy "my chocolate" for Christmas stockings. I have huge, HUGE chocolate CAKE issues. And the crazy thing is that I always hated chocolate cake growing up. Now I’ve baked my 3rd one in 3 weeks. Time to to stop this insanity! Hahaha! That’s a great post! 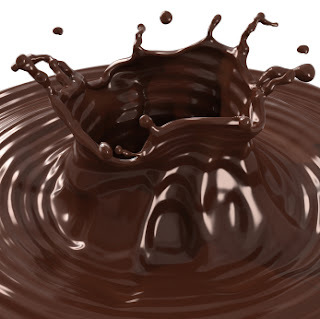 Don’t stop the chocolate…its the most important thing in the world!